The purpose of this project is to get HDR images using an Elphel camera. For informations about HDR imaging see: Wikipedia.org. For informations about HDR imaging algorithms see: Debevec.org and Columbia.edu. The autoexposure daemon running in the camera can rapidly alternate between multiple exposure times, allowing a single video stream with over / under exposed sequential frames. In post, these frames can be separated into individual streams and finally combined into a single HDR sequence. This HDR-video can be recorded just like any other normal video with the harddisk-recorder, camogm or captured over the network. Due to limitations in how fast the exposure time change can be propagated to the image sensor, HDR mode works best in Triggered mode(); And by altering the http://*CameraIP*/tuneseq.php?mode=latency- page, setting the EXPOS value to "0". (). HDR_VEXPOS - defines the exposure difference between the 2 alternating exposure times. 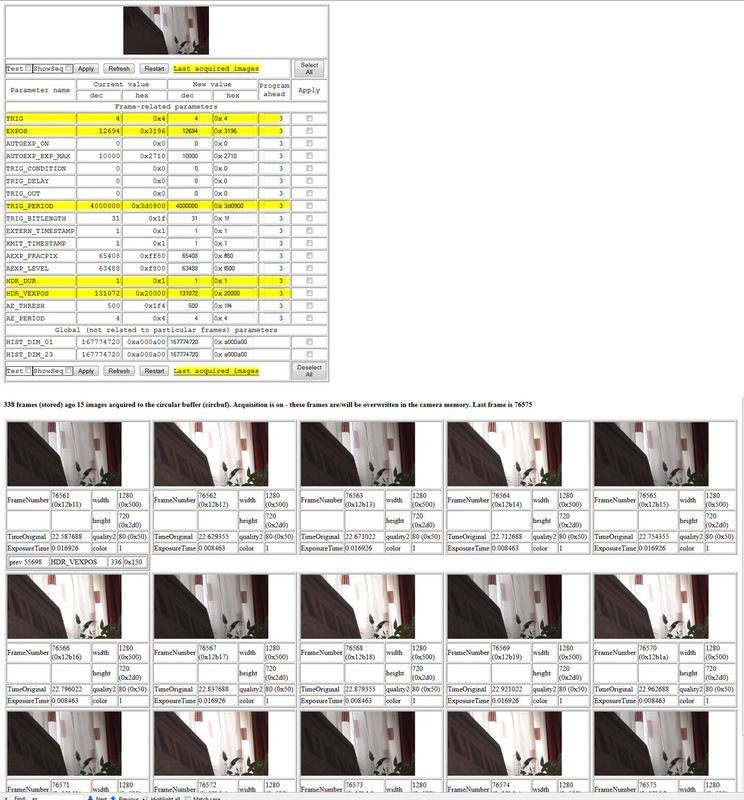 Also very handy is the "Last aquired images" link on top/bottom of the parsedit table as it shows a table of the last 9 images (total number, number per row can be altered in the URL) and the matching exposure time values. Please be aware though that mismatching parameters will lead to the exposure not alternating with each frame but every second, thirds, etc. 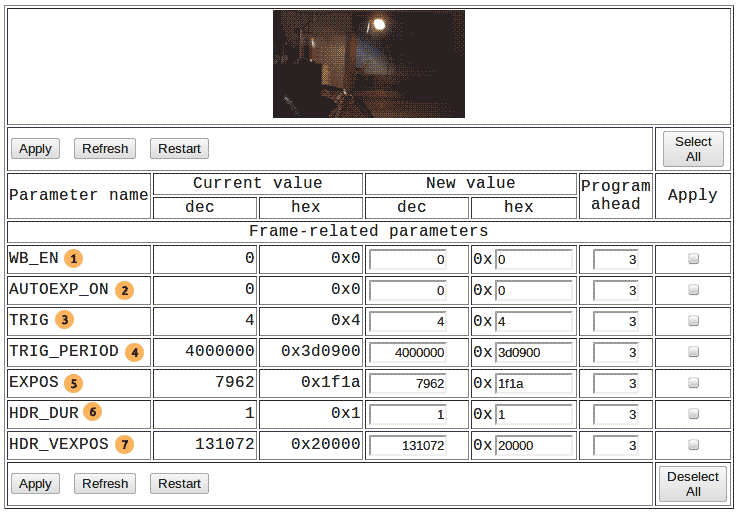 frame while the exposure time displayed in the table will seem correct but is actually wrong. You can do exposure bracketing manually with a PHP script. Just set exposure time -> capture a single frame -> change exposure time -> capture another image, etc. This will be slower than using the daemon but you have finer control over how many brackets you want and how big the EV steps between the brackets are, etc. This is best suited for still image recording where speed is not so much of an issue. JP4 HDR is a special raw color format that can capture a higher dynamic range in an image without introducing any artifacts as result from combining images captured at different times (exposure bracketing). Though the post processing code to develop the images is still experimental. This page was last modified on 23 January 2012, at 09:18.